Many people contact us wondering if they might be related to either Nelson Eddy or Jeanette MacDonald. In Issue #68 of Mac/Eddy Today, we devote the entire issue to their Genealogy and present the most complete study of their backgrounds ever published. For Nelson we trace the following family trees: Eddy, Van Buren, Ackerman and Kendrick including an interview with one his Kendrick cousins. For Jeanette we follow the McDonald (MacDonald), Wright and Johnstone lineages, with extensive discussion of her UK heritage. Did you know, for example, that Nelson’s 6-times great-grandfather owned a good-sized chunk of what is now Bergen County, NJ and he is buried in Hackensack, NJ? Or that Jeanette is related to a very old French family from many generations back on her family tree? One of the common assumptions is that Nelson Eddy is directly related to the 8th President of the United States, Martin Van Buren (photograph above). Nelson himself believed that to be true. Below is an excerpt from Journal #68 of Mac/Eddy Today, exploring that family line and setting the record straight. (c. 2007 by Mac/Eddy Club. All rights reserved.) All the other family branches for both Nelson and Jeanette can be found in Issue #68. Martin Van Buren, the 8th President of the United States, was directly related to CORNELIS MAESSEN (Van Buren) and Catalyntje Martense. From Cornelis Maessen descends a huge family tree in the United States. The following information is culled from several sources, including History of Cornelis Maessen Van Buren by H. C. Peckham. The numbers after each descendant’s name corresponds with their entry in the above book. MARTEN CORNELISSEN (#3), born 1638 or 1639(?) Died 13 November 1703, married Marytjie Quackenbosch about 1662. Marten owned a house, barn, etc, in Bethlehem, Albany Co., New York, and sold it in 1662. In May 1693, he married a second time, Tanneke Adams, widow of Pieter Pieterson Winne. Even though Marten is the son we are concerned with, the third son is also of interest. Maas Cornelissen, born in 1643 (?) changed his surname to Bloemendael, and the famous Bloomingdale family descends from Maas! Also, there were two later children of Cornelis Maessen, Styntji Cornelisse (Christina) who married and had 11 children, and Tobias, who appears to have died while a young teenager. PIETER CORNELISSEN (#156) was the 3rd child of Marten’s at least seven children, born 1670(? ); married 15 January 1693, Ariaantje Barentse (Meindersen), (supposedly the daughter of Barent Meinderts and his wife Eytie). MARTEN VAN BUREN (#174) was the 6th child of nine, baptized 28 December 1701; married 7 November 1729 to Dirckie Van Aelstyne (daughter of Abraham Jansen Van Aelstyne and Maritje Van Deusen). ABRAHAM VAN BUREN (#233) was the 5th child of 9 children, baptized 27 February 1737; died 8 April 1817; married about 1776, Maria Goes (Hoes), widow of Johannes Van Alen, daughter of Johannes Hoes and Jannetje Van Schaack. 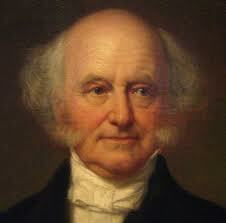 MARTIN VAN BUREN (#360), the 3rd of 5 children, baptized 15 December 1782; died 24 July 24 1862; m. at Catskill, 21 February 1807, Hannah Hoes. He was the 8th President of the United States. Nelson’s connection to the Van Buren family was through his grandmother, Caroline Netta Ackerman. Of interest is the fact that Caroline’s mother was a Van Buren (but not on the same family line as Martin Van Buren) but also an Ackerman! So – both parents were Ackermans. Below is Nelson’s family tree as it relates to the Van Burens. Note: a name in parentheses indicates that person’s father, as many Ackerman relatives had the same first name and it is difficult to sometimes identify which person one is referring to. Also, at some point the family began spelling the name Van Buren when originally it was Van Beuren. CAROLINE ISABEL KENDRICK, born 9 July 1879, married William Darius Eddy, 23 December 1899, died 19 December, 1957. She dropped the ‘Caroline’ and we know her as Isabel Kendrick Eddy. One son, NELSON ACKERMAN EDDY, born 29 June, 1901. Although there are several Pieters and Johannes on the Martin Van Buren line, they are not the same ones that are on Nelson’s Van Buren line. After careful study of all the known, legitimate offspring of Cornelis Maessen, and accounting for discrepancies in birth dates during those early centuries, it is safe to say that unless we are missing a family link, there seems to be no known direct familial connection between Nelson Eddy and Martin Van Buren. Of note is that Nelson’s maternal grandmother, Caroline Netta Ackerman, was also a singer and in1903 recorded “The Last Rose of Summer”. We have it available as a bonus on our CD JN121 of Nelson singing two radio shows with his mother. Get more complete information about the Genealogy of Nelson Eddy or Jeanette MacDonald in Mac/Eddy Today Issue #68. Read more sample articles from Mac/Eddy Today.